From childhood, it was clear that Laura's passion for drawing would lead to serious academic study of art, but having studied at Duncan of Jordanstone College of Art in Dundee, raising a family then took precedence over her artistic ambitions, although she continued to draw for pleasure. In 2004, with encouragement from those close to her, Laura made the decision to turn professional and the artwork you see on this website is just a selection of the wonderful drawings she has subsequently made. Laura's love of animals - and horses in particular - has been a significant factor in the path she has forged for herself in the world of animal portraiture. In considering each unique subject, Laura looks for character, personality, expression and movement and it is for her uncanny ability to pinpoint and capture this essence of spirit in exquisitely fine detail that she has won so many accolades from clients and the art world alike. Since Laura returned to art her renown has spread across the globe and her drawings can now be found in private collections throughout the UK, Belgium, Spain, America and as far away as New Zealand and Australia. 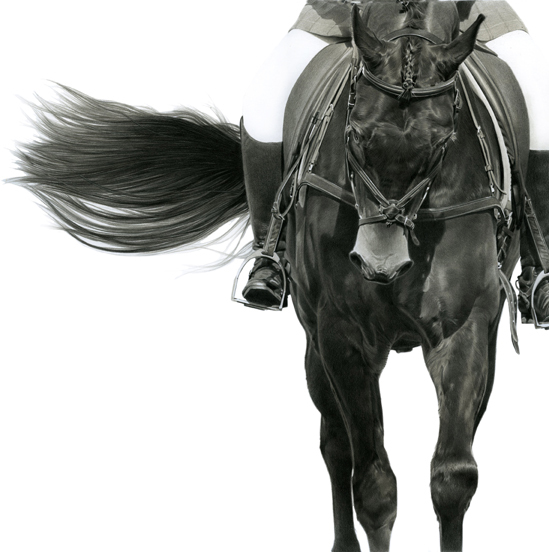 Laura is a member of the Society of Equestrian Artists, and works from her home studio in Edinburgh, where she still lives with her daughter.